Be the first to share your favorite memory, photo or story of Hattie. This memorial page is dedicated for family, friends and future generations to celebrate the life of their loved one. Hattie Ann Ziegler, 84 of Lodi, Ohio passed away Sunday, March 17, 2019 at her home following a period of declining health. She was born December 4, 1934 in Valley City, Ohio to Maurice and Leona (Betz) Klinect. Her family moved to Lodi where she grew up and graduated from Lodi High School in 1952. Hattie began working at Ohio Farmers Insurance (Westfield Companies) at age 17, and retired in 1994 after 42 years of service. Hattie was very active in the Lodi community. 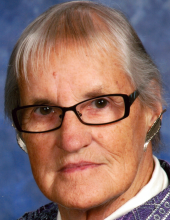 She was a member of Rebekah and Eastern Star Lodges, Lodi Historical Society, Lodi High School Alumni, Lodi Legion Auxiliary, Lodi UMC and Ladies Auxiliary, and served as Harrisville Township Zoning Inspector. She was an avid bowler, and was the first female to bowl a 600 series in Lodi. She was preceded in death by her parents, husband John Ziegler, and brothers James (Hoot) and Gerald (Windy) Klinect. A Celebration of Life will be held Saturday, March 30, at 11:00 AM at the Lodi United Methodist Church, 320 Medina St., Lodi, OH 44254. Rev. Diane Bell will officiate. Private family inurnment will be at Ohio Western Reserve National Cemetery. Memorial contributions may be made to Lodi United Methodist Church “Feed My Sheep” or Lodi Historical Society, P.O. Box 172, Lodi, OH 44254. "Email Address" would like to share the life celebration of Hattie Ann Ziegler. Click on the "link" to go to share a favorite memory or leave a condolence message for the family.